Discussion in 'TV Central' started by Barbara Fan, Oct 16, 2018. Blue Peter turns 60 today and when I was little this was compulsive TV for me, I loved John pete and val and John Noakes and his dare cdevil feats long before health and safety will always be my fav presenter. I did once see Simon Groom and Goldie filming in town when i was in senior school - a claim to fame. What is your era of BP and who were your fav presenters? Blue Peter, the world's longest running children's television show, turns 60 on Tuesday. In six decades, Blue Peter has seen 37 presenters - along with cats, dogs and tortoises - entertain and educate children over more than 5,000 episodes. The show first aired on 16 October 1958, in an episode that lasted just 15 minutes. It was intended to fill a gap in the BBC's output for children, serving those of primary school age in a weekly magazine programme. The first presenters were Christopher Trace and Leila Williams, seen below. Williams had been crowned Miss Great Britain the previous year. After she recorded the first programme she recalled going home to be greeted by her excited landlady who thought the show was a success. Trace had military and acting background, and was the stand-in for Charlton Heston in blockbuster Ben-Hur. He is cited as coming up with two of the best-known phrases associated with Blue Peter: "And now for something completely different," - later taken up by Monty Python - and "Here's one I made earlier." Created by BBC producer John Hunter Blair, the show was named after the flag flown by ships preparing to set sail, to symbolise a voyage of adventure and discovery. 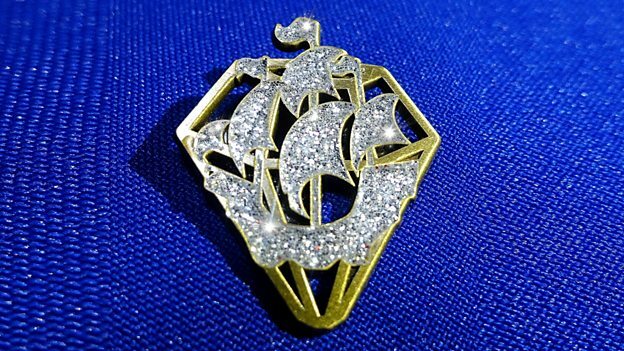 The ship's symbol, the Blue Peter Galleon, was designed by TV artist Tony Hart for a fee of £100. The theme tune is called Barnacle Bill, with several versions having been produced over the years. Biddy Baxter became the show's editor and producer from 1962 until 1988. Baxter was one of the few BBC producers to become a household name, and she was awarded an MBE in 1981. In an interview with the BBC, Baxter said: "A real bonus of working at television centre was the magic of being involved with a live programme, because there are no second chances, the co-operation you get is absolutely sensational. "We were always keen to put unusual and unexpected things in the studio." One famous example of an unexpected event was the guest appearance of Lulu the baby Indian elephant in 1969. Lulu's restlessness proved too much for her keeper, who was pulled around the studio as she ran rings around presenters John Noakes, Valerie Singleton and Peter Purves. In the excitement, Lulu had a "toilet accident" on the studio floor live on air, with the keeper slipping in the mess in a moment of Blue Peter slapstick. Singleton, Noakes and Purves are considered by many to have been the most famous presenters of Blue Peter. The trio are seen below with Petra the dog, Jason the Siamese cat and Shep the dog. A regular feature that became popular during Blue Peter's early years was the tradition of showing viewers how to make Christmas decorations. The advent candle decoration seen below with Noakes was a classic example but would probably not meet today's Health and Safety guidelines. Blue Peter badges have become synonymous with the show, earned by those who appeared on the programme. The first badge was awarded on 17 June 1963. Presenter Lesley Judd is seen below pinning a badge onto a guest in the 1970s. There are six types of badge: blue, green, silver, purple, orange and gold. Each colour denotes a different kind of achievement, with the gold badge being Blue Peter's highest award, only given to people who have shown outstanding bravery and courage, or have represented their country in an international event. Famous guests on the show have received a badge, including Madonna, Tony Blair, Dawn French and David Tennant. The Queen received a gold badge in 2001, seen below with presenters, from different eras, Simon Thomas, Valerie Singleton, John Leslie, Konnie Huq and Matt Baker joined by previous Blue Peter editor Steve Hocking. Other recipients of gold Blue Peter badges include David Beckham, JK Rowling, Torvill and Dean. It has also become tradition to present a leaving presenter with a gold badge on their final show. Below we bring you more memories of some of the 37 presenters in action from six decades of Blue Peter. From left to right below, Christopher Wenner, Lesley Judd, Goldie the show's pet dog, Tina Heath and Simon Groom are seen in 1979. One of her most memorable moments was when she went diving to see the Mary Rose ship. When learning to dive she met former presenter Mike Smith who she went on to marry. Janet Ellis was a Blue Peter presenter between 1983 and 1987. During her time on the show she went free-fall parachute jumping with the RAF. She is seen below with Goldie and K9 from Doctor Who. Mark Curry and Caron Keating were presenters in the late 1980s. During his tenure, Curry climbed up British telecom telegraph poles and Keating went diving with sharks. Yvette Fielding, seen below on the left with Keating and Curry, joined Blue Peter aged 18 in 1987, replacing Greene and becoming the show's youngest presenter. Fielding performed with the Moscow State Circus and also trained Bonnie the dog. Anthea Turner, presenter from 1992 to 1994, holds a place in Blue Peter history as the queen of arts and crafts and the creator of the legendary Thunderbirds Tracy Island. Many remember the resourceful instructions given by Turner on how to build the model out of toilet rolls, foil, cardboard and scrunched newspaper. Blue Peter received more than 100,000 requests for the Tracy Island factsheet in 1993. Turner still has the original model she made, seen below in 2015. The 1990s also saw presenters Katy Hill, Richard Bacon and Konnie Huq (left to right below). Huq became the longest running female Blue Peter presenter, presenting the show for 11 years until 2008. One of her memorable moments includes visiting Bangladesh and speaking to members of her extended family who she had not seen for many years. Simon Thomas is seen below in Peru taking part in the Blue Peter Stamp Aid Appeal in 2000. He applied for the job three times before becoming Blue Peter's 27th presenter. In the 2000s, the presenters (along with Huq) included Zoe Salmon, Gethin Jones, Liz Barker and Matt Baker (clockwise left to right below). With Meg the dog, they are seen launching the Blue Peter Treasure Trail Appeal in 2005, asking children to donate old and foreign coins, loose coins and unwanted mobile phones, to help raise money for ChildLine. In 2009, presenters Joel DeFries, Helen Skelton, and Andy Akinwolere (below left to right) travelled to Turkey with the Blue Peter bus. The show is famous for its dynasty of pets, including dogs, cats, tortoises and parrots. An early Blue Peter dog is Honey, seen below in 1965 with presenters Christopher Trace and Valerie Singleton. Bonnie the dog was on Blue Peter for 13 years and co-starred with 13 presenters. She is seen below when she retired from the show in 1999 with presenters (left to right) Katy Hill, Konnie Huq and Simon Thomas. She was awarded a Blue Peter badge for her services to the programme. The current Blue Peter presenters, Lindsey Russell and Radzi Chinyanganya, are the the 36th and 37th presenters. They are seen below on this year's Sport Relief. The pair are seen below interviewing the Duke and Duchess of Cambridge in 2017. To mark the 60th birthday of Blue Peter, previous presenters will be joining Russell and Chinyanganya for a live special episode on 16 October at 5pm BST on CBBC. Blue Peter is one of those shows where you can almost know someone's age from the presenters they remember best. Simon Groom/Peter Duncan/Sarah Greene is the team I remember most fondly. Unfortunately, my loyalty to the show was sorely tested when Blockbusters came along onto ITV. I'm afraid Bob Holness won out most of the time. I did own one. Not that I did anything special to earn it, mind you. Pupils from my school were chosen to attend an event hosted by Blue Peter in my home town, which was all very exciting. Sadly couldn't tell you where the badge is these days. Anyway, happy diamond anniversary, BP. oh ditto, Id have loved to be on Blockbusters and get on the infamous Gold run! cant believe they actually sent him up this in his sand shoes and not a safety harness in sight!! they were made of much stronger stuff (and madness) back in the day!! Id have loved to be on Blockbusters and get on the infamous Gold run! And of course you could have asked Bob for a "P". Oh I know what you mean. I feel like a very poor BP fan to have misplaced mine. Weren't they just!? I can't get over how quiet Trafalgar Square seems too. I never really watched Blue Peter, I always found it a bit too twee and middle class. Even when they made stuff from waste, I found the items they used were not things we would have had at home. I only watched it if I had nothing better to do. I much preferred Blockbusters and Batman repeats on ITV. I was an avid viewer of it in its 1980s BBC1 heyday. It was compulsive viewing. The presenters I remember best are Simon Groom, Peter Duncan and Janet Ellis. I was always jealous of my sister who had won a blue peter badge as this gained free admission to various attractions and theme parks. Interestingly, I found myself in the (very small) current 4th floor Blue Peter studio on a tour of the media city studios in Salford, last year. Apparently, Blockbusters is coming back. A reboot will air six years after the last incarnation on Challenge tv.